Did you know that yam ring has a romantic history behind it? It was originally created by a chef who wanted to win over his future wife! Not only does this dish have a romantic history, but for Jordi, it holds a lot of sentimental value for him as he reminisces the fond memories during reunion dinner with his family when he was a child. It is always nostalgic for him when he prepares this dish! Through cooking, Jordi believes that by putting your heart and soul into it, your meal will always be much more memorable when sharing it with your loved ones as well. We can’t wait to share this incredible recipe with you! 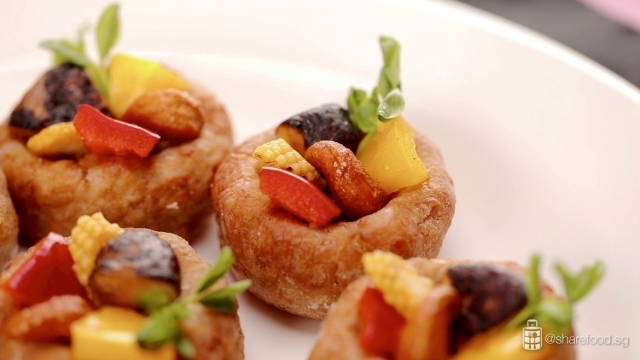 Bringing to you, Abundance Mini Yam Ring – Jordi’s version of yam ring in a miniature form! 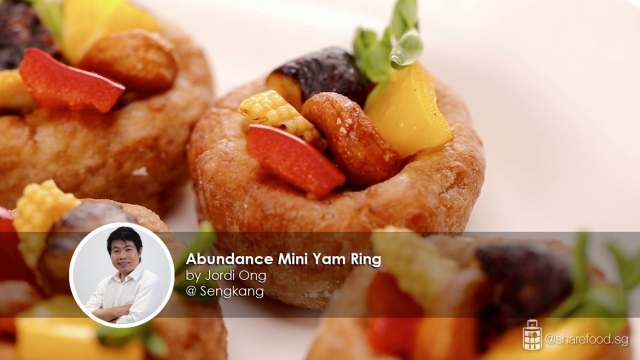 Bringing to you, Abundance Mini Yam Ring – Jordi’s version of yam ring in a miniature form! Before we start, here are some of the ingredients that you would need for this recipe. For the yam rings, you will need to prepare yam, corn starch and water, as well as some condiments such as sugar, salt, five spice powder and white pepper! For the fillings, you will need: red and yellow capsicum cut into small pieces, some fresh shiitake mushroom, baby corn and cashew nuts! The yam dough must be moist enough so that during deep frying, the yam wouldn’t disintegrate. Let’s start to prepare the yam first. Heat up the steamer and steam the yam for 15-20 minutes on high heat. Once it’s soft enough for mashing, remove from steamer to let it cool. Add in corn starch and water in a bowl and mix well before adding in sugar, salt, white pepper and five spice powder. 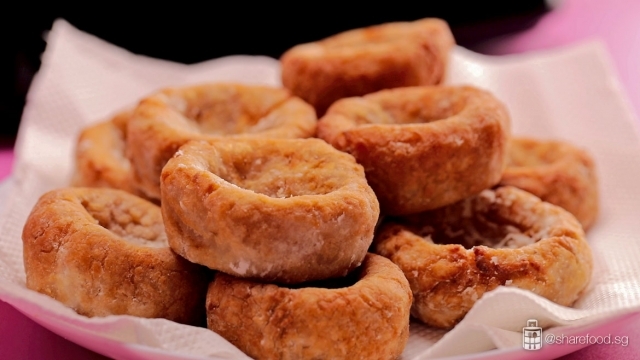 Take note that the yam dough must be moist enough so that during deep frying, the yam wouldn’t disintegrate which is a common issue when frying yam ring! If you’re preparing the ingredients beforehand, remember to cling wrap the yam dough and keep it in the fridge for up to 2-3 days. Make a small well in the middle while coating the yam ring with corn starch. Next, shape and cook the yam ring. Here comes the fun part where you can engage the kids! 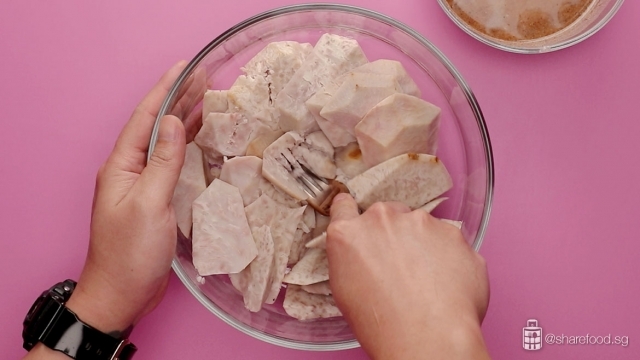 Coat your hand with cornstarch and roll the yam ball into 40g each. 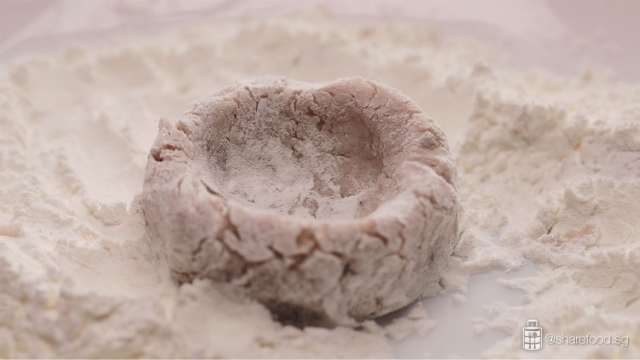 Use cornstarch to shape the yam ring so that it is easier to shape and will be crispier when deep frying! Then, make a small well in the middle while coating the yam ring with corn starch. Repeat this process till all the ingredients are fully utilized! Frying in small batches prevent the yam from sticking onto each other and keeps the oil temperature consistent! Remember to replace the oil regularly if you deep fry often, so that the food flavour and texture will not be affected! Pour oil into a frying pan and heat it up to 200 degrees. By using the Knife premium cooking oil, not only does it enhances the fragrance of your dish, it is also trans-fat free and free of cholesterol! Do take note that the temperature has to be accurate to prevent the oil from seeping into the food during frying! Proceed to add in the yam ring one by one and fry in small batches for 5 minutes or until golden brown. Frying in small batches prevent the yam from sticking onto each other and keeps the oil temperature consistent! Remember to replace the oil regularly if you deep fry often, so that the food flavour and texture will not be affected! Drain the oil once you’re done and cool the yam rings. Stir fry the rest of the ingredients for the filling for 5 minutes. 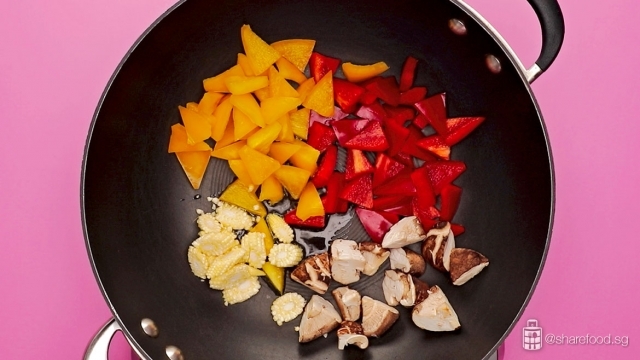 In a frying pan, heat up 1 tbsp of oil and stir fry the ingredients for the filling for 5 minutes. 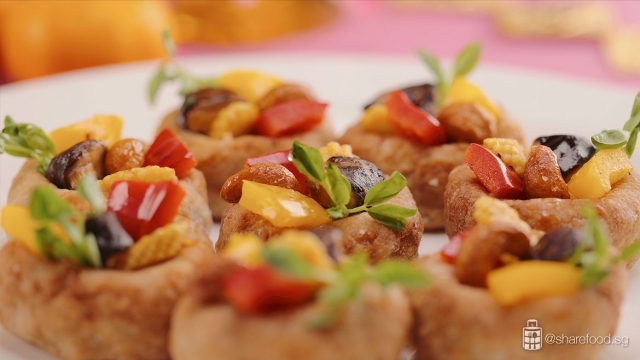 Assemble the yam ring, drizzle honey over it and some pea sprouts for garnish before serving! There you go! The perfect dish for Chinese New Year. Don’t they look like the traditional Chinese yuanbao? 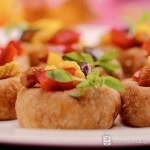 Abundance Mini Yam Ring look so adorable! Don’t they look like the traditional Chinese yuanbao? This dish is good to kickstart your reunion dinner so you don’t feel too full before you even get to try the rest of the dishes. Let us know what other Chinese New Year dishes you love! Heat up the steamer. Steam the yam for 15 – 20 mins on high heat. Once it soft enough for mashing, remove from steamer and let cool. In a bowl, add in corn starch and water. Mix well. Add in sugar, salt, white pepper and five spice powder. Stir to mix evenly. Mash the yam using a fork and pour in the corn starch solution. Knead with hands and ensure all ingredients are well incorporated. #Tips: The dough should be moist and pliable. Coat hand with cornstarch. Roll the yam ball into 40g each. Make a small well in the middle, with base. Coat the yam ring with corn starch. Repeat the same steps till all the ingredients are fully utilised. Pour oil into a frying pan, heat it up to 200oC. Add in the yam ring one by one and fry to 3 – 5 pcs in a batch. Deep fry for 3 – 5 mins till golden brown. Drain the oil and place it on a cooling rack. Set aside. 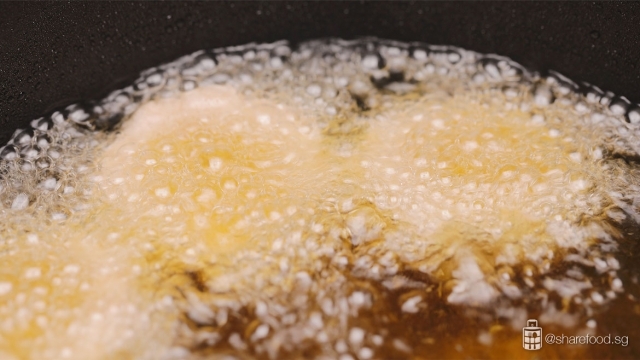 In a frying pan, heat up 1 tbsp oil. Stir fry the ingredients for filling for 5 min.